Yesterday I worked myself ragged. I was so sore, and felt so decrepit, I had to take 2 Advil before I went to bed! We had some gorgeous sunshine, and I was able to paint outside for most of the afternoon. My poor little girl was home sick with a bad sore throat, so I let her rest and checked in on her while I worked. The first piece I will show you from yesterday's painting marathon is this fun little chippy secretary. I found this a few weeks ago, and it was in great shape. Very, very simple, but I knew that by adding a pretty little applique to the front, and a fun pop of color inside, it would give it a lot of character. 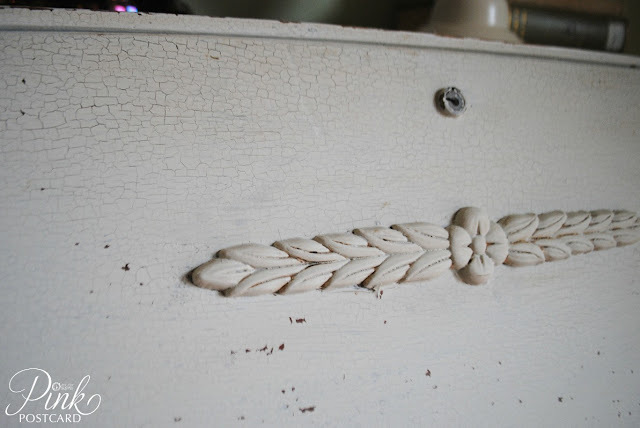 I used Miss Mustard Seed's milk paint in Ironstone. It is a very soft gray- almost white with a hint of gray, really. This piece was originally just stained- I knew that the finish on it would be perfect for what I wanted to do. The only prep I did was a quick - and I mean quick, not thorough- wipe down with a cleaning wipe. No sanding, no primer- nothin. 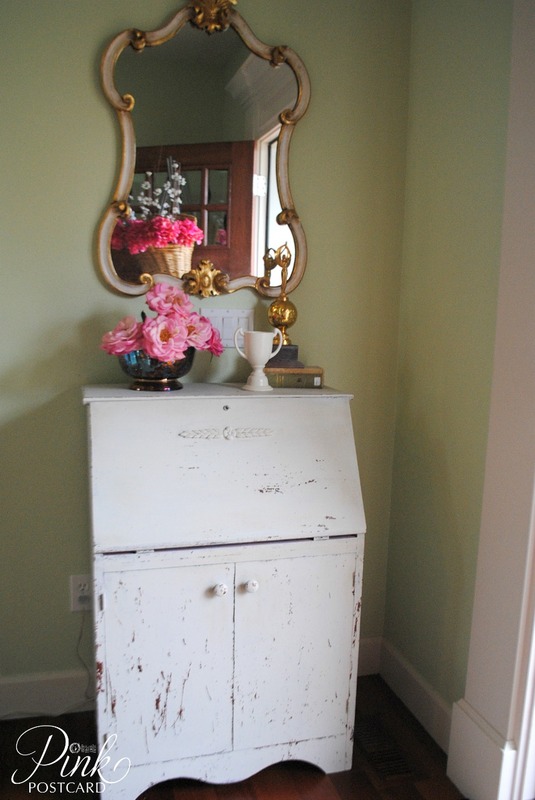 I then painted two coats of the milk paint. Both in the same afternoon, waiting just long enough for the first coat to thoroughly dry and then re-coating with a second coat. It did exactly what I hoped, and then some. See that fabulous crackle finish? All on it's own! MMS has a crackle medium, but this was just the paint doing it's own thing. I even highlighted it with some dark wax just on the crackly parts. As the second coat was drying, I could see the paint beginning to chip and curl. Once everything was good and dry, I took the metal putty knife to it and scraped away. It was great seeing the response when I posted it on Instagram yesterday! It's been so long since I did anything in pink (selling wise), it was fun to add this in. Kind of ironic for 'Pink' Postcard. I gave it a light distressing inside as well, but most of it was just done on the Ironstone. 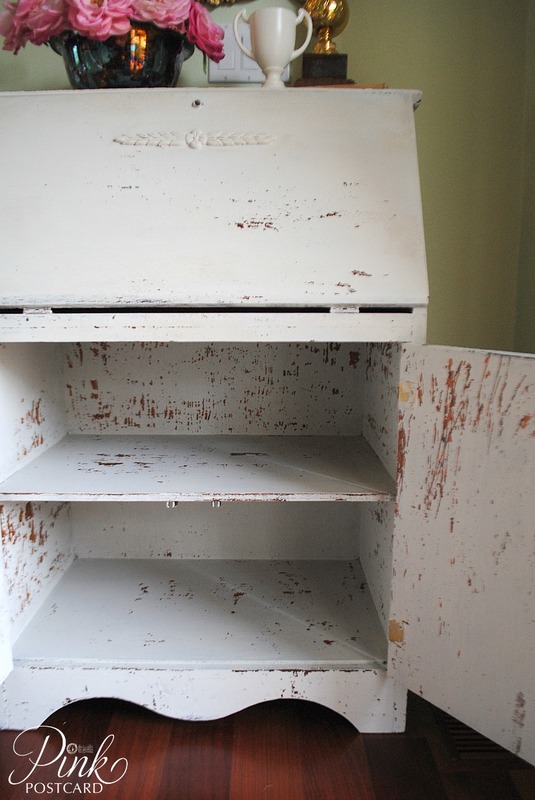 The bottom cupboard area was also painted in the Ironstone and heavily distressed. I am having so much fun with the milk paint. I love the authentic, chippy look it gives to the pieces I've used it on. Tomorrow, I have a small side table to share with you! Have you used MMS paint? Are you digging the chippy look, or do you prefer to get the smooth finish with it? This piece is now available in my room at Aunt Bee's House. I have some more exciting news to share about my space there as well- but for later. 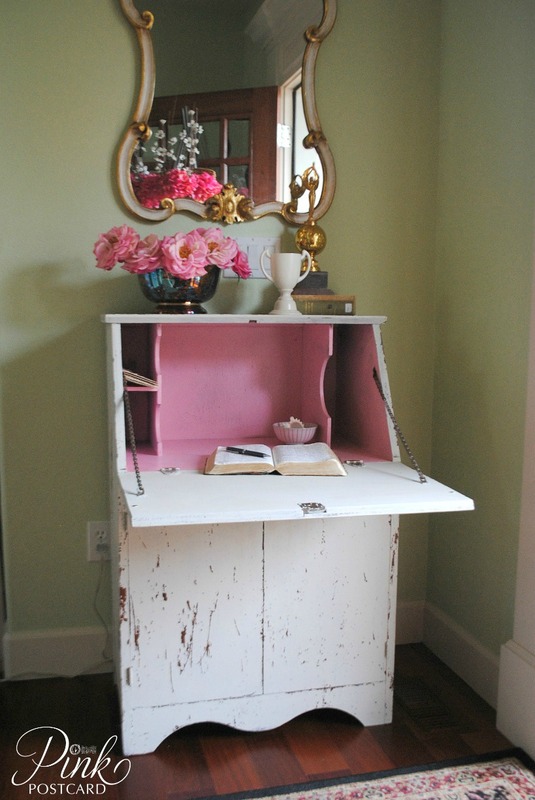 Love this.... and the special touch of pink inside.... great piece! Denise...your secretary looks wonderful. I need to try the milk paint. Looks great! What a cute piece and you did such a nice job with the painting. Have a great week and hope your daughter gets better soon. Denise what a beautiful piece!! I just love it. I have not used MMMP yet. Just played around with it. The mixing is not my thing. Love it! (As I did on Instagram, too :) ) The paint looks like you found it old and weathered, I was surprised to read that you did all that! The pink is such a fun unexpected pop of color. 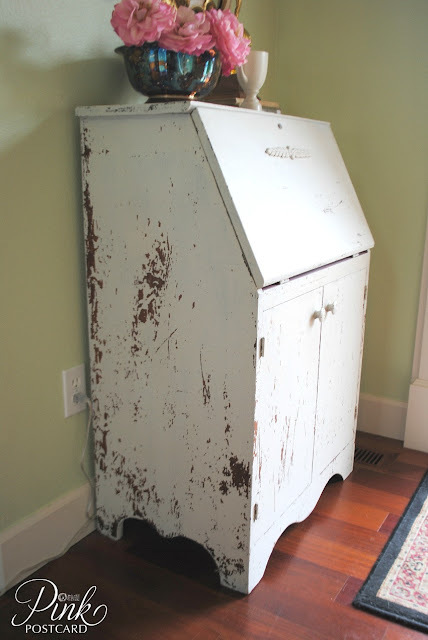 I used milk paint once--but not on the right kind of project. I love how this turned out! lately people have been saying that pink doesn't sell--it still sells to me! 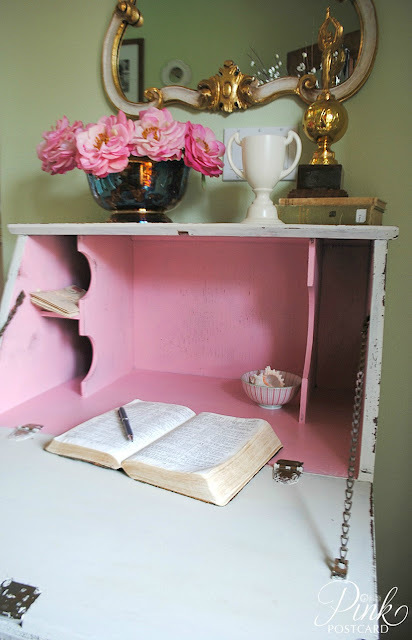 Pink makes me happy...and it can be overdone--but this is perfect! Too cute! And yes, I've used MMSMP and I LOVE it. I need to get at it again and paint some more stuff - I have ironstone just waiting on me to use it. This turned out beautifully. I also love the mirror above. Beautiful job, Denise! Love the pink inside. So sweet. so so perfect. the pink is the exact right pop for this. Oh my! That is so gorgeous1 What a terrific addition to your home! I love it! The color is so pretty and the pink interior is an unexpected surprise. I just posted about one that's in need of a serious makeover and I love the finish you got from the milk paint. Very inspiring. I love the hit of pink, such a happy detail!